These are some of the blog entries that I’ve written over the years that have to do most specifically with my experience with doctors, my having had Proton Therapy in 2008, hospitals, as well as my upcoming preparation for Walking Miles 4 Brain Matters and being on that walk. Go to www.myedgewalkerblog.com if you’re interested in reading more about my experiences as a patient, or the rest of my “regular life”. 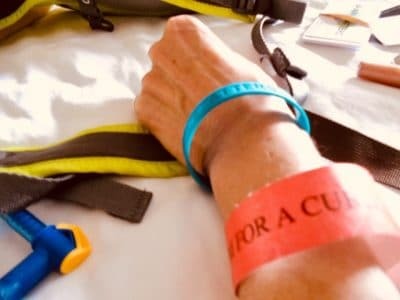 It is about what I’ll be able to give to others…and to a cause that I know needs more funding…and that not many other people either know about unless they themselves or someone in their family has been effected by a brain tumor. In fact, even if they do know about brain tumors, they may not know that there’s such a need for more funding or research. This walk is also about something else. This walk is about achieving something…it’s about the feeling of overcoming something. It’s about being able to feel the feeling of gain after so many years of feeling the feeling of loss. I have the potential to feel strong, and the fact that it’s not just for me and it’s something that I’m also able to do for others, just makes it feel like that much more of an accomplishment. In the research I’ve done about people who have had life threatening or life altering illnesses, the feeling of loss is quite normal, but knowing about its normalcy doesn’t make it less painful. You’re not sure what to do with these feelings. Recently a few “normal” things happened to a few friends of mine. A couple of my friend’s fathers died. Another friend’s friend died…he wasn’t that old. All of my friends were going to the funerals. I haven’t been to many funerals. Another good friend of mine on the 5th anniversary of her husband’s death was going to visit a place the two of them went to all the time together. I liked the idea of this; it got me thinking about these ceremonial rituals. There was something that seemed important to me about them. I didn’t grow up in a family that had many passing rituals. I’m from a small family and fortunately most of us are still hanging in there. It’s not like we haven’t had our share of sad times, we have, but we’re still here, that too says something about us I think-about our fortitude, our stamina, maybe even a bit of luck. I’m not entirely sure what it says, but it seems to say something…it’s another blog for another day. We do have our rituals, just not for passing. We celebrate birthdays, anniversaries, Thanksgiving, but “passings” or “loss”…these occasions I’m not so familiar with…except for our pets, we have had burials for our pets. As I mentioned, we certainly had our share of bad things that have happened, but we were more of the attitude that you kept on keepin’ on, and so we did…so I’ve done. For many years with the exception of a few friends who’ve lost a parent early on, or in very extreme cases a friend of theirs, I was one of the only people among my group of friends that has dealt with so much personal loss so early on…now that we’re all getting older, everyone is catching up. Lately though, I’m seeing more of the ceremonial side of things, and it made me think. I decided to anoint a small beautiful glass jar that I have; this jar would now be my “Jar of Loss”. 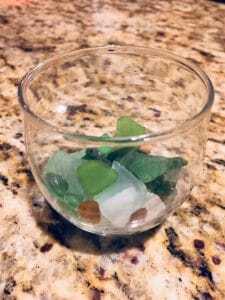 I had some sea glass that a close friend of mine has sent to me over the years from places she has traveled to from around the world…she knows I love sea glass. I chose a specific piece of sea glass to honor every loss I have experienced, and I placed it in my new Jar of Loss. There is a piece of sea glass in this jar for every loss that has deflated me, every person that has left me, every ability I used to have that I no longer have…my hearing in one ear, my vision in one eye, my voice that I feel has been altered, the house I loved, the company I created but couldn’t keep working at because I had to have surgery and radiation therapy, every thing that I felt I had lost but could not control losing. Some how this made me feel better; it has made me feel ready to move on in a stronger way. This jar gives me the ability to see these things, to have them with me and yet not, to look at them in a physical kind of way if I wish to, but not feel the same morbid sense of sadness that I had before…it’s different and it feels better.